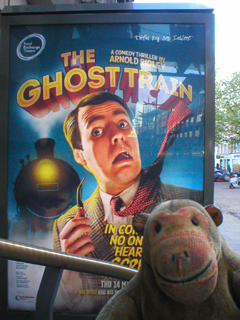 Mr Monkey caught a bus into Manchester and strolled down to the Royal Exchange Theatre for the press night of The Ghost Train at the Royal Exchange. The Ghost Train was written in 1923 by Arnold Ridley (who later became famous for playing Private Godfrey in the Dad's Army comedy series), after he'd been stranded for a night at a small station near Bristol. Six passengers have got off a train at Fal Vale Station, only to be told by an irritable stationmaster that there are no more trains. This is directly due to the behaviour of an annoying young man who fulfilled a lifetime's ambition to pull the communication cord on a train. As a result, the rest of the passengers - a newly wed couple, a couple whose marriage is on the rocks, and an old lady travelling with a parrot - are quite reasonably annoyed with him. Before the stationmaster abandons them at the isolated station he explains that the station is haunted by a ghostly train and a ghostly signalman. He then drops dead. Over the next two hours strange events plague the stranded travellers, and they find out more than they want to know about the ghost train. 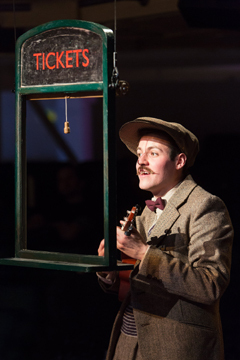 This production is presented by the Royal Exchange in cahoots with the Told By An Idiot Theatre Company, who have successfully visited the Exchange before. The entire play is set in the single waiting room so the set is a little more ornate than for some recent productions. There's a rather posh waiting room bench, a stove with a passing resemblance to the boiler of a steam locomotive, and a mix of other vintage railway paraphernalia. The entire set transforms marvellously at the end of the play. As Mr Monkey expected from Told By An Idiot the play starts slightly oddly, with a pair of announcers providing sound effects and reading the actors lines before the actors. Mr Monkey was a little worried as he was more or less directly behind these interlopers and couldn't see the stage, but the stationmaster quickly scared the announcers and their sound effects trolley off. The play then continued more conventionally, if you count having a parrot being played by a human as conventional. 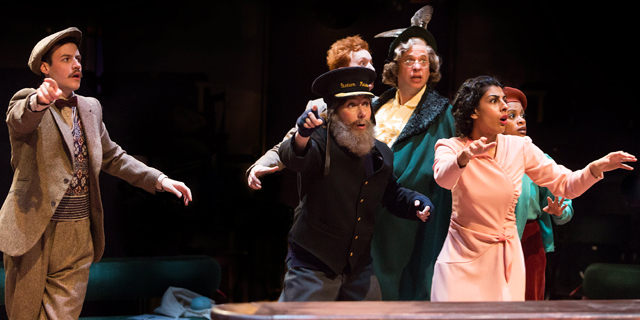 The cast throw themselves into the play - and at parts of the audience - enthusiastically, with just the right level of over-the-top gusto. The production makes Calum Finlay's Teddy less irritating than he seems in the radio and film adaptations Mr Monkey is familiar with, which is pleasing. Javier Marzan is marvellous as Miss Bourne, but Mr Monkey was a little disappointed to see that the programme didn't credit the actor playing the parrot (for what it's worth, Mr M reckons it was Joanna Holden, who also plays Jackson the policeman at the end). 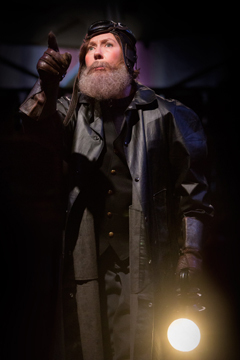 Mr Monkey thoroughly enjoyed this production, which apparently effortlessly manages to be innovative and modern, yet respectful of the source material. Mr Monkey heartily recommends it to anyone who wants a fast-paced laughter-filled night out. The Ghost Train runs until 5th June 2015.